Western Australia is probably the most diverse state in Australia. From the lush green forests of the South West to the dry, barren land of the North, it offers an amazing variety of environments. For this reason it is a fantastic place to travel as you will never see such diversity in one place. Western Australia has something for everyone – whether you are into history and culture, sightseeing, lying on the beach or shopping and partying, your desires will be satisfied by this gorgeous state. 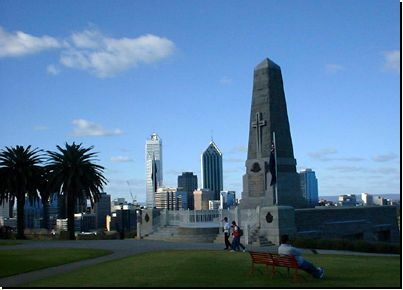 180° view of Perth City, from Kings Park. Perth is a unique city with great shopping, gorgeous beaches, plenty to do, and beautiful weather in which to enjoy all the activities on offer. 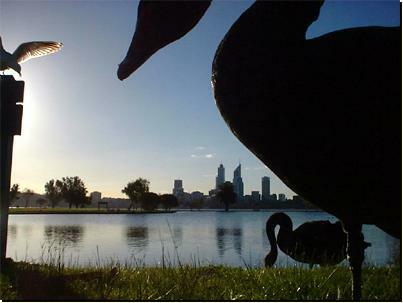 Although Perth is one of the most isolated cities in the world, there is much to see and do within the city. Entertainment: Northbridge is one of Perth's suburbs for after-dark entertainment. Here you can find some of Perth's best nightclubs which play various music from dance to pop to hip hop, as well as plenty of pubs and bars which promote live music. Or, if you're after a more relaxed night, try one of the many Northbridge restaurants serving a variety of cuisine from Asian to Italian and Mediterranean. An abundance of spaghetti bars, Chinese karaoke restaurants, cafés, fine-dining restaurants and coffee houses ensure that every taste is catered for. There are also a number of theatres and concert clubs and pubs to be found in the suburbs. Subiaco is very popular with a number of arthouse cinemas and theatres on offer. 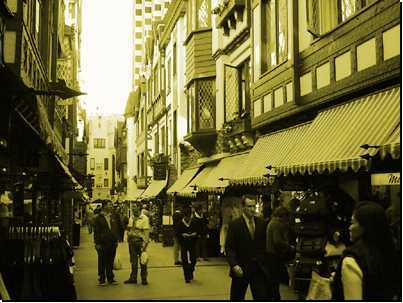 It is also lively during the day, with the great shopping atmosphere of The Colonnade, a collection of small shops, from clothing boutiques and shoe stores to cafés. Just down the road from The Colonnade is a completely different style of shopping at the Subiaco Markets where you can find a variety of market stalls from those selling artwork to music under the one roof. Burswood Casino, located about 5 minutes outside the city has 140 gaming tables and 1168 slot machines as well as cocktail bars, an Irish pub, restaurants and a Cabaret lounge. The casino is open 24 hours a day except for Christmas, Anzac Day and Good Friday. Perth has a number of large shopping centres so you can find whatever you're after. The Galleria is the main shopping complex north of the river and Carousel south of the river. Both offer excellent variety with many boutique stores plus major department stores like Target and Myer. Whether it's clothing, shoes, souvenirs, jewellery, chocolate or body products you're after, these shopping centres will satisfy your needs. 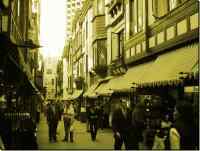 The city of Perth itself is a popular shopping area with its charming arcades which run between the Hay and Murray Street Malls between Barrack and William Street. The city has an assortment of shops, from department stores to clothing boutiques, candy stores and opal and souvenir stores. Perth is fantastic for duty free shopping with several large duty free stores. Enjoy lunch or a coffee at one of the many small cafés found in the malls and arcades, or a drink at one of the pubs just outside the main shopping district. If you're more into cultural activities, try the Western Australia Art Gallery located between Perth and Northbridge which boasts Australian, Aboriginal and international art. Entry is free. There are also a number of museums in Perth such as the Aviation Museum in Bull Creek, the Francis Burt Law Museum in the Supreme Court Gardens, and the WA Medical Museum in Subiaco. For sports fans there is the WACA (Western Australian Cricket Association) Museum in East Perth. Besides museums there is a variety of other historic sights such as the Old Mill located at the southern end of the Narrows Bridge. This was Perth's first flour mill and was constructed in 1835. It has since been restored and contains interesting relics of pioneer days. Other places of interest include Government House, the Supreme Court and the Old Gaol. The Perth Mint, established in 1899, is the oldest mint in the world still operating from its original premises. Here you can watch a gold pour in the original melting house as well as buy a variety of gold souvenirs. 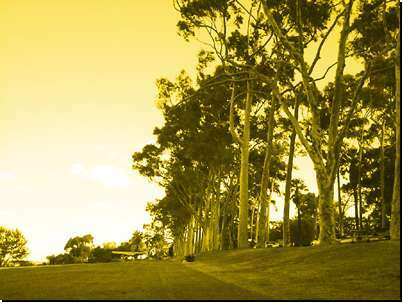 Perth is well-known for the distinctive flora and breathtaking views of Kings Park. Located just outside the city centre, King's Park is a great place to enjoy views of the city or join the volunteer guides on a walk through the park to see some of Western Australia's beautiful wildflowers and bushland. Have a barbeque or enjoy the fine dining experience offered by Frasier's restaurant. To see some of Australia's distinctive wildlife, visit Caversham Wildlife Park located 19kms from Perth in the Swan Valley. There are over two hundred species on show, and the park's main attractions include kangaroos, koalas, wallabies, and Tasmanian devils. Cohuna Wildlife Park, located about 20kms south of the city also offers a variety of native animals. Perth Zoo is located in South Perth and houses animals native to Australia as well as those found in the African Savannah and Asian rain forests. You can take a leisurely walk through the zoo or catch the zoo train, and there are plenty of barbeque and picnic areas as well as places where you can purchase food. In summer twilight concerts are also held at the zoo. Fremantle is a historic port, founded in 1829, located half an hour south of Perth. There is plenty to see and do within the town which is easily reachable by train. Fremantle Prison, located on The Terrace, was built by convicts during the 1850's and was in operation until 1991. Visitors can gain an insight into life inside a maximum security prison and convict imprisonment as well as examine the distinct architecture of the prison. The prison is open daily from 10am to 6pm. Night tours are also available on Wednesday and Friday nights at 7:30pm – bookings are essential. The city offers a number of museums, detailing its interesting history which dates back to the mid-nineteenth century including the Maritime Museum, Army Museum, Fremantle History Museum and the World of Energy. Fremantle is also well-known for its markets. There are several located in the town which are open on various days of the week such as the E-Shed Markets and Fremantle Markets. The University of Notre Dame has restored many old Fremantle buildings and factories so that they now function as classrooms and libraries. It is WA's only private, Catholic university. Fremantle is famous for its Cappucino Strip (South Terrace), a street boasting dozens of cafes and restaurants with al fresco dining. There are also several nightclubs and pubs in the town. Other things of interest in the city include Samson House, St John's Church, the Old Customs House, the Roundhouse, Moore's Building, Monument Hill and Fremantle Town Hall. There are also many Dock sheds which have been turned into art galleries, shops and so on. Rottnest is a small island off the coast of WA, best known for the little furry creatures native to the island, quokkas. There is plenty to do on the island; relax on the beaches, participate in water activities, have a round of golf, explore the town or take in the history of the island on a historic walking tour. A popular way of seeing the island or just getting around is by bike. There are bikes for hire on the island. The Swan Valley is located about 25 minutes from Perth city. It is a popular tourist spot with dozens of vineyards, restaurants and galleries. Peaceful and scenic, the Swan Valley is the home of several well-known winers such as Houghton's and Sandalford's. If beer is more your thing, visit the newly opened Duckstein Micro-brewery on West Swan Road. The valley is not only popular for its wines but also its restaurants which range from café-style to fine dining. Wine-tasting tours by bus or horse-drawn carriage are available and probably the best way to see the area and to enjoy the wines. There is plenty of accommodation available from hotels to cottages and caravan parks. The Vines Resort, is also located in the Swan Valley. The resort boasts a beautiful 36-hole golf course as well as tennis and squash courts, pools and gym facilities. There are several restaurants and bars within the resort, and different types of accommodation such as hotel rooms or individual units. Perth has almost every kind of accommodation imaginable; hotels and motels both in and outside of the city, caravan parks, units and chalets. Perth's public transport system, Transperth, provides buses, trains and ferries which allow you to reach most places of interest. The cost of using public transport depends on how far you wish to travel, but it is fairly cheap. Travel within the central city is free. Tickets can also be bought which allow unlimited daily travel.